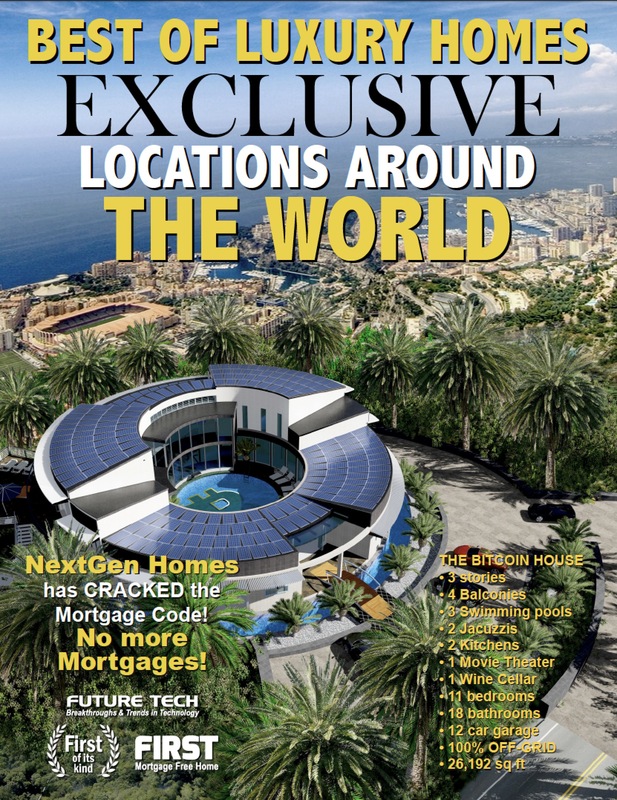 Next Generation Living Homes is excited that we are expanding in 16 countries around the world. We are currently accepting PRE-SALES and reviewing PRIVATE LENDING and JOINT VENTURE opportunities for the Bitcoin House and land purchases in the Miami, Florida, Malibu, California, the Mediterranean regions of Spain, Monaco, Italy, and in the Caribbean Island of Bermuda, Cayman Islands, Barbados and Jamaica. We are reviewing coastal locations, water front properties and Mediterranean Sea views for the development of several luxury Bitcoin homes built using our unique architectural designs and steel frame technology for fast development. These Luxury homes range $5M-$235M. We invite you to SIGN UP below to our PRIVATE LENDING & JOINT VENTURES Newsletter to review our latest opportunities, which will also include Crypto investments in conjunction with Salt Lending so you can keep your Crypto Assets through the loan process. We also accept Crypto Sales. You can receive our project updates as they become available to our PRIVATE LENDING & JOINT VENTURE Real Estate projects. Please use the Newsletter SIGN UP form below to submit your information. All information submitted is confidential and will never be share with a 3rd party. If you have a background in Real Estate, Construction or Funding please include your related info here. This press release contains forward–looking statements. The words or phrases “would be,” “will allow,” “intends to,” “will likely result,” “are expected to,” “will continue,” “is anticipated,” “estimate,” “project,” or similar expressions are intended to identify “forward–looking statements.” All information set forth in this press release, except historical and factual information, represents forward–looking statements. This includes all statements about the Company’s plans, beliefs, estimates and expectations. These statements are based on current estimates and projections, which involve certain risks and uncertainties that could cause actual results to differ materially from those in the forward-looking statements. These risks and uncertainties include issues related to: rapidly changing technology and evolving standards in the crypto mining industry; the ability to obtain sufficient funding to continue operations, maintain adequate cash flow and execute its business strategy; volatility in the Bitcoin market; and other factors set forth in the Company’s most recent press releases and printed materials. Readers are cautioned not to place undue reliance on these forward–looking statements, which reflect management’s analysis only as of the date hereof. The Company undertakes no obligation to publicly revise these forward–looking statements to reflect events or circumstances that arise after the date hereof. Readers should carefully review the risks and uncertainties described in our web site and documents that the Company releases from time to time via our Web site, Email Newsletters and printed brochures.